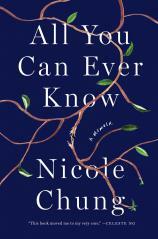 Personal and expansive, intimate and wise, Nicole Chung's memoir is a fiercely successful balancing act of family, identity, becoming and love. Chung was born 10 weeks premature, and her Korean birth parents gave her up for adoption within a matter of months. Her adoptive parents were white Catholics living in a predominantly white Oregon town. They couldn't have children but desperately wanted to. So when news reached them that a baby was available for adoption, they rejoiced, and took the necessary steps to proceed. When they were informed that the baby was Korean, they dismissed it --- as if that could ever impact their love, or their desire to have a child. "Compassion-filled, truthful and page-turningly compelling, ALL YOU CAN EVER KNOW is dexterous, honest work. Exquisite and inquisitive, it gets at the heart of what it means to belong." 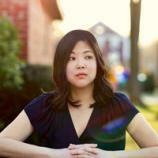 Chung writes with warmth and earnestness, exploring deftly the complicated questions that tangle the story of her life. She always maintains care and compassion for every character: her birth parents, her adoptive parents, and the woman she would come to know as her sister. No one is idealized, or burdened with the full brunt of her hopes, her grief and her longing. As a child, Chung navigated the layered, emerging challenges of being both Korean in a predominantly white town and a transracial adoptee. She confronted racism at an early age, but had neither Korean family and community to share the experience with, nor any actual sense of Korean identity. Her parents were only well-meaning, but this was not an experience they could possibly understand. As a young woman, the questions Chung always harbored about her birth family came to a head when she and her husband were expecting their first child. She was pregnant, about to give birth and become a mother, and all she knew of motherhood came from a woman who never bore a child. As Chung's own body started to change, as her relationship with her own unborn daughter began to form in a very real, physical way, she initiated the journey of searching for her birth family. Her discoveries are heartwrenching, expansive and messy, far from the idealized reunion she might have pictured as a child. Reconnection could never have been a tidy thing, but instead was built choice by choice. She comes to find family and truth in ways she could not have imagined.